I absolutely love this plant, and this blog does a great job at explaining why. The familiar and unpretentious bird’s-foot-trefoil (Lotus corniculatus) seems to be spread all over the Scottish landscape; it is found on grasslands, meadows, rock ledges, sand dunes, derelict sites and roadside verges. This perennial herb, member of the legume family (Fabaceae, which includes peas, vetches, broad beans and clovers) is valued in many countries as pasture, hay, and silage, although it has become an invasive species in some parts of North America and Australia. 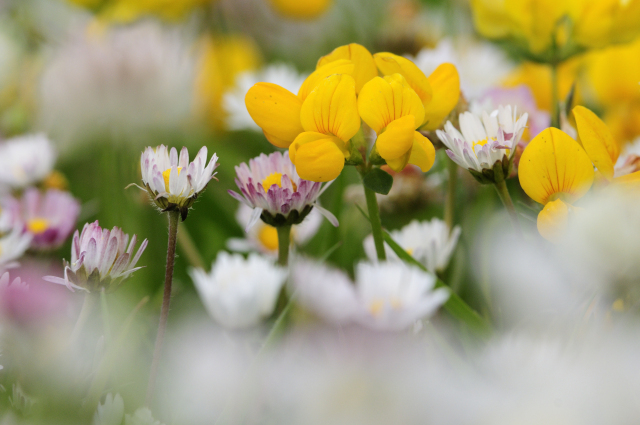 But more importantly for the aspect of ecosystem services, the bird’s-foot-trefoil is a larval food plant for several butterflies and moths and a valuable nectar source for many other insects. And, like some other legumes, the bird’s-foot-trefoil produces highly nutritious pollen.